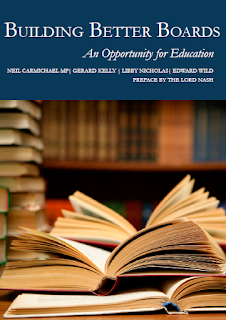 This report seeks to assess the state of school governance today and makes proposals that are intended to enable governors to respond to the challenges presented by a rapidly changing educational landscape. Governance used to be the Cinderella of schooling, receiving little attention from government ministers and policy wonks. That has now changed. The much discussed Trojan Horse affair has shown up the damage than can be done when governance goes awry. The move towards academisation, and with it the diminishing power of Local Education Authorities has placed an increasing burden on governors to monitor the performance of their school or group of schools in the case of Multi Academy Trusts. The preface by Lord Nash highlights the excellent work of the All Party Parliamentary Group for Education Governance and Leadership. He recognises the importance of governance as an agent for change in a school-led system. It is instructive that head of Ofsted, Sir Michael Wilshaw chose to devote the second of his monthly 'commentaries' to the subject of governance for 21st century schools. By 'school-led system' Nash means schools working together under the auspices of an Academy Chain or Multi-Academy Trust. The jury is out on whether academies perform better than maintained schools, especially when it comes to raising standards for disadvantaged students. But with David Cameron wanting all schools to have the 'opportunity' to become an academy by the end of the current parliament, it looks as though the drive towards academisation remains a key plank in the government's education policy. But if governors are going to help fill the vacuum left by the decline of LEAs they are going to have to sharpen up their act. The report emphasises the need for governors to be appointed on the basis of their skills and for existing governors to engage in high quality training and professional development. The authors are rather sniffy about Parent Governors. They would like to see a shift from the stakeholder model towards skills-based governance, as if it's a case of either the one or the other. I disagree. It is rather patronising to suggest that Parent Governors don't necessarily have the skills needed to govern. At our school Parent Governors are a highly skilled bunch, but they are also passionate about seeing the school attended by their children continuing to make rapid progress. A concern about Parent Governors only being interested in the welfare and progress of their own darling children can be resolved by effective induction and training so that they understand the strategic nature of the role. The answer to the tendency for governor meetings to be sidetracked by parents raising issues to do with their children is good chairing, not getting rid of Parent Governors altogether. The core functions of governance are: 1. Setting the Vision, Ethos and Strategy of the school. 2. Holding the Headteacher to account for the educational progress of the school. 3. Ensuring value for money. In all those areas parents have a role to play, as well as school leaders, staff, members of the local community and governors appointed simply on account of their skills. In any case, when Parent Governor vacancies become available it is good practice for the role advertisement to include a description of the desired set of skills that a parent might bring to the table to complement the existing team. Do we really want a situation where Governing Boards are almost exclusively comprised of accountants, lawyers and high-powered business men and women? With all due respect to the good people of those professions, that would represent a considerable narrowing of the range of interests and backgrounds represented at board level. But whatever the composition of our boards we need to ensure that governors are trained and empowered to contribute to the strategic leadership of their schools and to hold senior leaders to account. In her recent address to the NGA conference Emma Knights issued a rallying call to governors that we would do well to heed. Attention is given to the challenges of governance in Multi-Academy Trusts, especially in the light of the Education and Adoption Bill 2015-16. The bill will legislate to make it harder for maintained schools judged 'Inadequate' or 'coasting' by Ofsted to resist being forced to join an Academy Chain or MAT. However, recent Ofsted reports arising from the inspection of Chains and MATs suggest a mixed picture when it comes to these 'school-led systems' being able to turn around failing schools. Often the problem with poorly performing schools is not their maintained status, but ineffective leadership and weak governance. Forcing a struggling school to join a group that may share those characteristics isn't going to help anyone (see here and here). Far better for a successful local school to offer school-to-school support at leadership and governance level to an underperforming neighbour. But where is the funding to facilitate that kind of thing? If MATs are the way to go, let them at least be area-wide set-ups that are the product of a shared vision, ethos and strategy, not 'marriages of convenience' with several schools in one part of the country and a few dotted elsewhere, having little in common save a bit of branding. The aspect of this report that garnered media interest was the proposal that governors, notably Chairs should be remunerated for their work. Sir Michael Wilshaw concurs with this view in his 'commentary' . However, while reasonable expenses should be paid so that no one is left out of pocket for their efforts, I'm not sure that I would want governors to be paid. That does not make us dilettante amateurs, but 'unpaid professionals', who seek to serve as governors in local schools for the common good of the communities in which we live. Even when it comes to Chairs, it is difficult to see how either they would be offered little more than an insulting pittance for their work, or be paid so much as to change the nature of the role in a detrimental way. Chairs might be reluctant to do anything that might deprive them of 'a nice little earner' and fail to upset apple carts that sometimes need upsetting. Effective chairing might be better secured by in-post chairs taking advantage of high quality training such as the Chairs of Governors' Leadership Development Programme. Thoughtful succession planning is also vital for ensuring continuity of good leadership at the helm of the GB. One area that did not receive sufficient reflection here was the professionalisation of clerking. If more is going to be expected of governors and they are to remain unpaid for their services, then governing boards are going to need the support of highly effective clerks. The role of the clerk is to offer the board procedural and legal advice and guidance, organise and prepare for meetings, take minutes and so on. Too often clerks are regarded as semi-professionals who routinely work well over their contracted hours. They are not always subject to regular performance management to help ensure their continued professional development. This needs to change. Effective clerking is essential for efficient, sharply focused and properly functioning school governance. I don't want to sound too negative about this report, though. That fact that governance is being given attention in a document like this is welcome in itself. There are some good things here, such as arguing the case for governors to engage in rigorous self-evaluation. The emphasis on skills and training is welcome. The pieces on The Importance of Communications and Promoting the Role of Governors are helpful enough. The findings of Building Better Boards should stimulate discussion among governors as to how we may best respond to the challenges that we face in the current educational climate. Boards would do well to review their practices in the light of the report's recommendations. While not all of the proposals found here may command agreement, they at least deserve serious thought and consideration. I am grateful to the publisher for supplying a free review copy.